The Donation Grid lists all historical payments (Donations, Grants, Event Tickets, InKind, etc.) in order of date, most recent date first, for the selected Contact. Modify the fields visible on the Donation Grid under Maintenance > Site-Setup > Field and Screen Customization > Screen Layouts. Click Screens and Layouts for more information. Along the bottom of the grid list the Grid Totals. By default the totals will list the Lifetime to Date totals, including all pages (not only the current page). If you change filters to the Donation Grid, such as listing only those “Membership” DonationType donations, the totals will then give a total of only those filtered. 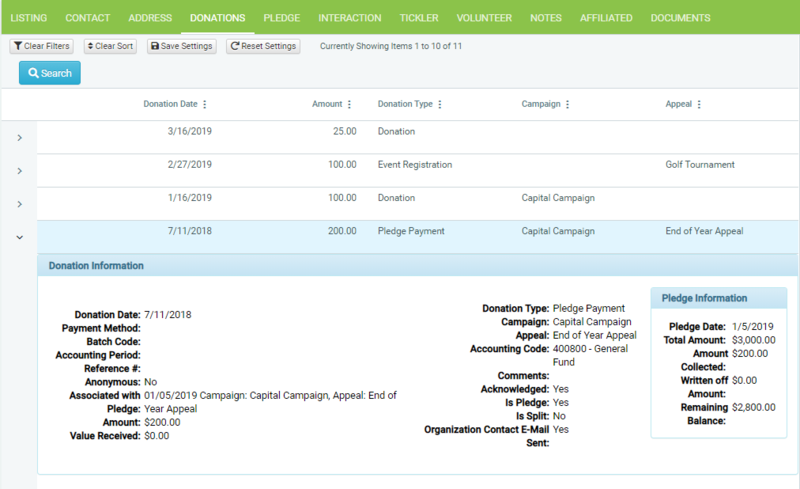 DonorSnap maintains some system information about donations. You will not see these fields when in either the Add or Edit mode since you are not able to change this data.